My Son Is Doctors Without Borders' 1,000th Ebola Survivor : Goats and Soda Liberian health worker Alexander Kollie lost his wife, daughters and brother to Ebola. Then his son tested positive for the disease. He survived, and now father and son are building a new life. Saturday, the 21st of September, is a day I will never forget in my life. I was out working with MSF [Medecins Sans Frontieres/Doctors Without Borders] as a health promotion officer in Foya, in the north of Liberia, visiting villages and telling people about Ebola: how to protect themselves and their families, what to do if they start to develop symptoms and making sure everyone has the MSF hotline number to call. Later that night, my brother called me. "Your wife has died." I said, "What?" He said, "Bendu is dead." I dropped the phone. I threw it away and it broke apart. We were together for 23 years. She understood me. She was the only one who understood me very well. I felt like I'd lost my whole memory. My eyes were open, but I didn't know what I was looking at. I had no vision. I had tried to talk to my family about the virus and to educate them, but my wife did not believe in it. I called my wife begging her to leave Monrovia and bring the children north so we could be together here. She did not listen. She denied Ebola. She was staying in the capital, Monrovia, with three of our children. Later that same week, I received another call from Monrovia. My brother, who was working as a nurse, had been taking care of my wife. But he became infected and died, too. Then my two youngest children were taken to the center in Monrovia, but my girls were very sick and they died. I felt even more helpless. I was breaking in my mind. I couldn't make sense of anything. My eldest son, Kollie James, was still in Monrovia in the house where our family had been sick, though he was showing no signs of illness. He called me and said, "Everyone got sick, I don't know what to do." I told him to come here to Foya to be with me. When my son arrived, people in the village would not accept us. They told us that our family had all died and to take Kollie James away. I was angered by their reaction. I knew he wasn't showing any symptoms and was not a threat to them, but because of the stigma, they wouldn't let us stay. We had to move on. The next morning, though, I noticed my son looking more tired than usual. I was worried about him. He didn't have any symptoms like vomiting or diarrhea, but he just looked tired. I called the Ebola hotline and MSF brought him to their Ebola care center here in Foya to be tested. When the test came back positive, it was a night of agony for me. I didn't even shut my eyes for one second. I spent the whole night just crying and thinking about what would happen now to my son. The next day the counselors at MSF calmed me down. They told me to wait. To hold my peace. I sat with them, and we talked and talked. I was able to see Kollie in the care center from across the fence, so I called out to him, "Son, you're the only hope I got. You have to take courage. Any medicine they give to you, you have to take it." He told me, "Papa, I understand. I will do it. Stop crying, Papa, I will not die, I will survive Ebola. My sisters are gone, but I am going to survive and I will make you proud." Every day, the counselors made sure they saw me, and they sat with me so I could talk. The way the counselors talked to me helped me relax. They knew it's not a small blow that I am receiving in life. I didn't want to see my son in there. When I saw him in there, I thought about his mother. I already lost her, I wanted him to survive. I wanted him to be strong. Until that moment I saw him coming outside, I could not truly believe that it would happen. I've seen people with Ebola start to look strong and then the next day, they're just gone. So I was also thinking, maybe Kollie will be one of those who will be gone the next day. When finally I saw him come out, I felt so very, very happy. I looked at him and he said to me, "Pa, I am well." I hugged him. Lots of people came to see him when he came outside. Everybody was so happy to see him outside. 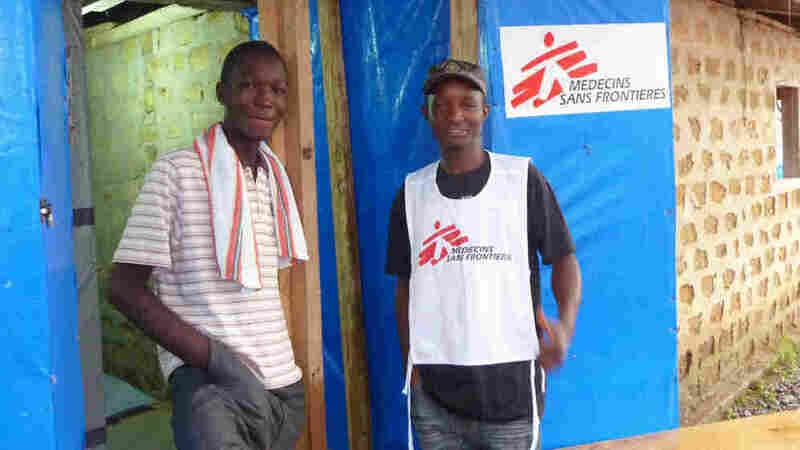 Then MSF told me that Kollie is the 1,000th survivor from Ebola. This is a great thing, but I was wondering, how many more people have we lost? How many have not survived? Of course I am so happy to have Kollie still, but it's hard not to think of all those who are no longer with us. When I took him home with me, he actually had a smiling face. And me, too, I had a big smile on my face. I had a very good smile that day. I decided to have a little party for him. Since then, he and I do everything together. We sleep together, we eat together and we have been conversing a lot. I asked him, "What's your ambition after you graduate from high school?" He's a 10th grade student. He told me that he wants to study biology and become a medical doctor. That's what he told me! So now I'm going to try every way I can to meet his needs and succeed in life, so that he should not feel so bad about the pain he has suffered losing his mother. I told him, "Now I am your mother and your father. I am serving as both for you now." And he told me, "I will do everything for you as my father." He is so pleased I called him to be with me. The care that was given to him here was a hundred percent. Now that my son is free of Ebola, we will make a life for ourselves. He is 18 now, so I will make him my friend. Not just my son, but my friend, because he's the only one I have to talk to. I cannot replace my wife, but I can make a new life with our son. The original version of this story was published on Oct. 21, 2014, on MSF's website.